A-HOTEL.com - Luxury and cheap accommodation in Noyabrsk, Russia. 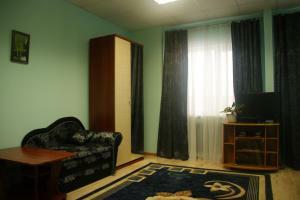 Prices and hotel, apartment booking in Noyabrsk and surrounding. This indicative offer was derived from the most recently booked accommodation in Noyabrsk and sort by the price, from cheapest Noyabrsk accommodation to the most expensive hotels. To select accommodation by your preferences we recommend to choose from 21 accommodation offers in Noyabrsk in total. By entering the dates of your overnight stay in Noyabrsk and using the filter tools you can sort the best possible accommodation for you. The entered dates of your stay are crucial for the most accurate offer as it derives all the online information on pricing and availability of Noyabrsk accommodation. Then you can book the selected Noyabrsk lodging (hotels, apartments etc.) immediately. Apartment on Vysotskogo 6 is set in Noyabrsk. Guests are welcome to enjoy the free WiFi. Located in Noyabrsk, Hotel Cesar offers a bar. Featuring a 24-hour front desk, this property also provides guests with a restaurant. Free Wi-Fi, a 24-hour reception and a restaurant serving traditional Russian cuisine are features of this Noyabrsk hotel. It is just a 5 minutes’ drive from Noyabrsk Train Station. Located in Noyabrsk, Hotel Rossiya provides free WiFi. Boasting a 24-hour front desk, this property also provides guests with a restaurant. Located in the city centre of Noyabrsk, Hotel Alaska features an on-site restaurant, a sauna, free Wi-Fi throughout the property, and free private parking. All of the rooms at Hotel Alaska are decorated in a modern style, and rooms that can accommodate guests with disabilities are available. Located in Noyabrsk, Hotel Lesnaya provides air-conditioned rooms with free WiFi. Featuring a 24-hour front desk, this property also provides guests with a restaurant. Just 5 km from Noyabrsk Airport, this hotel offers a 24-hour reception, a restaurant serving European cuisine, and rooms with soundproofed windows. Wi-Fi is free of charge. Located in Noyabrsk, Beliye Nochi Hotel features free Wi-Fi throughout. It offers a 24-hour front desk and billiards is available on site. Located in Noyabrsk, Hotel Belaya Gora offers a bar. Among the facilities of this property are a restaurant, a 24-hour front desk and room service, along with free WiFi. Boasting air-conditioned accommodation with a balcony, Apartment on Sovetskaya 101 is located in Noyabrsk. This apartment also features free WiFi. Hotel Uyutnaya provides accommodation in Noyabrsk. All rooms feature a TV with cable channels and a private bathroom. A 5-minute walk to the administration centre of Noyabrsk, Sever Plus offers simply decorated rooms. Gazprom Neft is 300 meters away. Featuring free Wi-Fi throughout, Sad Hotel is located in Noyabrsk. It offers a 24-hour front desk and guests can have their meals at the on-site café, which serves Russian specialities. Located in Noyabrsk, Hostel Yevropeyskiy features a shared lounge. Free WiFi is provided. Located in Noyabrsk, "Магистраль" offers free WiFi. All guest rooms at the hostel are fitted with a seating area. 88 улица Советская is set in Noyabrsk. This property offers access to a balcony. Boasting accommodation with a balcony, 84б проспект Мира is located in Noyabrsk. Guests staying at this apartment have access to a fully equipped kitchen. 1 улица 8 Марта is set in Noyabrsk. Guests staying at this apartment have access to a fully equipped kitchen. Городилова 10 is located in Noyabrsk. Guests staying at this apartment have access to a fully equipped kitchen. 67 Магистральная улица is set in Noyabrsk. The apartment comes with a cable TV, 2 bedrooms and a living room.